Will your roof protect you in the next big storm? Are your insurance premiums high because you have an older roof? Is there a repair needed, but you’re putting it off until the last second? Protect your most valuable asset—your home. Get a free inspection and estimate today. Your roof is the first line of defense from storms. In our coastal area, heavy winds, heavy rain and wind-driven rain can pose a serious threat because of a compromised roof. Heavy sustained winds we experience from severe storms will test a roof for any weakness. Continuous exterior cladding including roof, siding, windows and doors help maintain a sealed building envelope which is critical to keeping a home or other building protected and intact during high wind storms. There are some things insurance can NOT replace – such as the lives of people, pets, precious family possessions and memories. Replacing a roof after hurricane damage can subject you to extended displacement as local contractors quickly get back-logged from the sudden high demand. Often at this point there is now more than just roof damage – there can be other wind and water intrusion damage such as ruined drywall, insulation, cabinets, flooring, etc. Mold can set in easily if these components are not properly removed and/or dried out. Replacing a roof gives you the chance to upgrade the storm resistance of your home or other building – in addition to the new roof system, we can enhance performance by supplemental roof deck nailing, installing self-adhered underlayment, and installing hurricane clips. One of the key areas to save significantly on insurance premiums is to have a new or properly maintained roof. The accrued savings over a period of time often justifies the roof investment. Some optional enhancements made during roof replacement can save additional money on premiums. Specifically, the roof deck nailing, self-adhered underlayment and hurricane clips mentioned above. Replacing or enhancing an existing roof usually allows opportunities to increase the roof/attic ventilation. This can provide a healthier exchange of fresh air and reduce the heat load on your insulated living areas and cooling equipment. There’s no doubt a roof has a dramatic effect on the home’s appearance, one way or the other. Today’s roofing industry offers many creative options to protect your home while adding a personalized beauty. Today, many buildings all over Florida are protected by asphalt shingles. Choosing the right shingle roof system and the right contractor to install it can help beautify and protect your home, business, church or organization for years to come. Asphalt shingles have been used on homes in the United States since the early 1900s. Since that time, leading shingle manufacturers, like CertainTeed (established in 1904), have been continually improving asphalt roofing products through their research and manufacturing efforts. Today, asphalt shingles can be purchased in an array of colors, designer styles and weights. These products have become so attractive and rugged that 80 percent of the homeowners in the United States choose asphalt shingles. Steel Rib Panels are economical exposed-fastener sheets of steel that can be installed on many types of structures. The panel’s ribbed design adds to its strength, and is easy to install, which makes it an affordable option. The rib panel is available in a painted finish as well as an unpainted Galvalume metal finish. 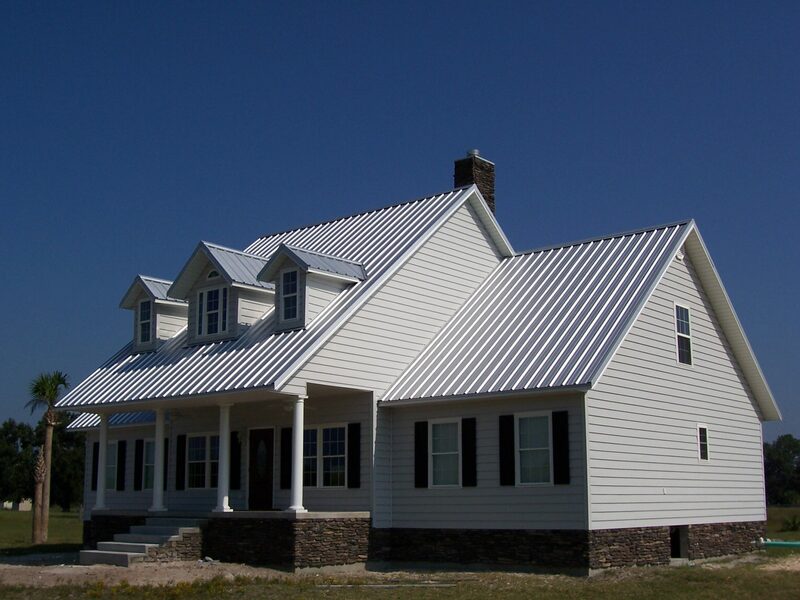 Standing Seam metal roofs offer a high level of protection, beauty and longevity. Roof panels and components are interlocked, attached to the roof deck with concealed fasteners and offer a clean, graceful appearance. Standing seam panels are available in a painted finish as well as an unpainted Galvalume metal finish. Aluminum is also available for areas close to salt water. Stone Coated Steel roofing has been around for 50 years and offers a very high level of protection, beauty, design flexibility and energy efficiency for commercial and residential property. Stone coated steel roofing comes in tile, wood shake and shingle profiles. It has the authentic look of these traditional roofing products, with all the modern benefits of a high-performing, superior steel roof system. Low Slope Flat Roofing systems can be appropriate for residential property as well. Some home additions such as a porch, for example, may have been constructed with a flat roof system. If you are concerned about your existing flat roof, or you are designing a project with a flat roof, we can install the proper low-slope products.